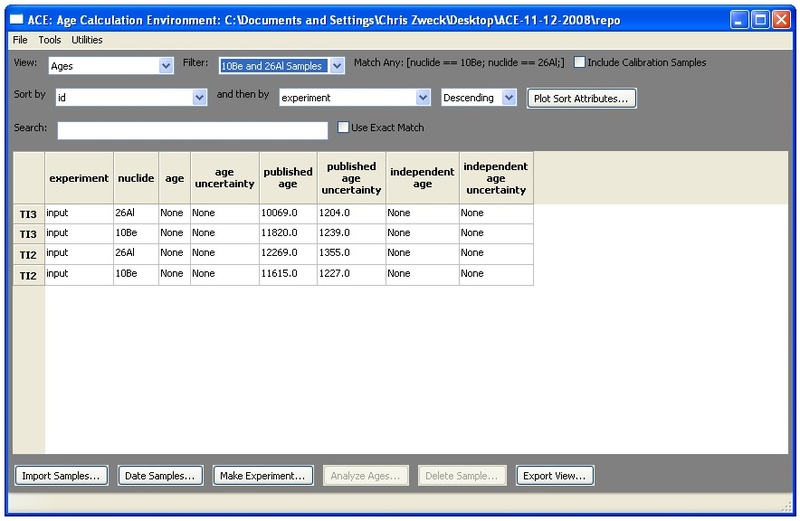 The top part of the sample browser is designed to help with viewing sample details, and is divided into three sections. 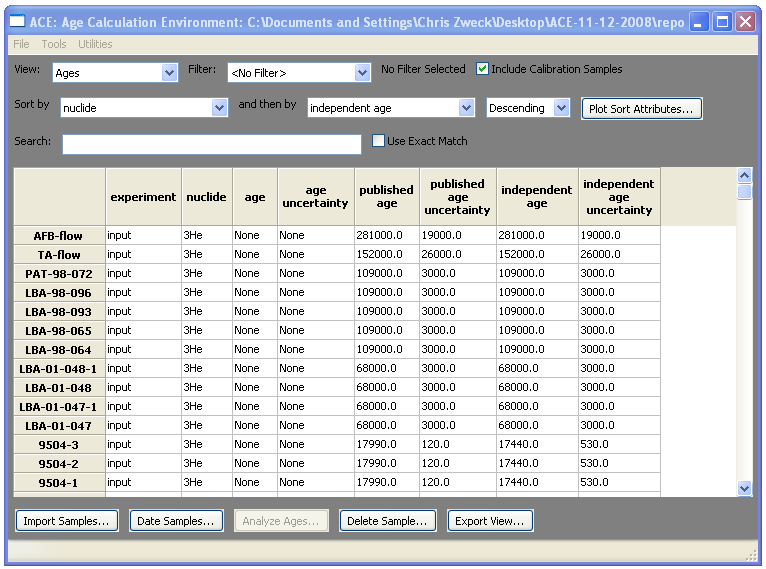 The upper section (View) chooses which samples to show, the middle section (Sort) chooses the order to show them, and the lower section (Search) reduces the list of samples to only one or two for quick reference. We describe these sections below. 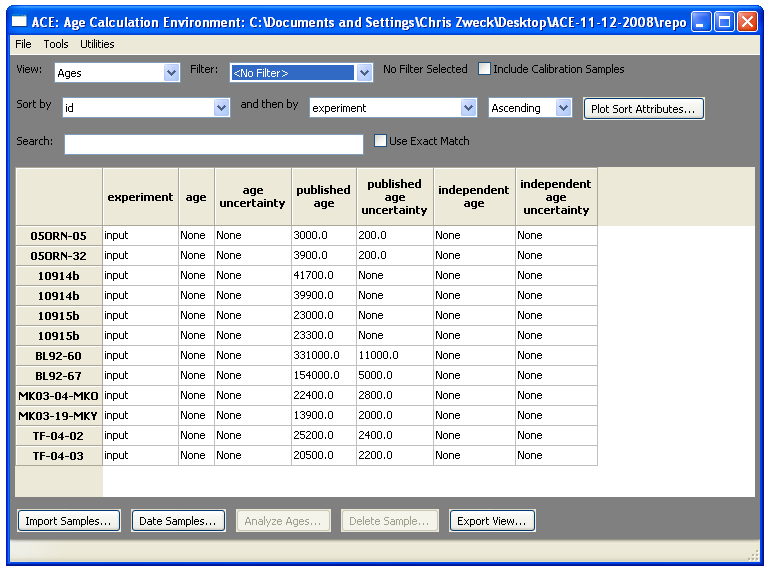 The sample browser columns change so that only attributes related to age (calculated, published, or independent) are shown. 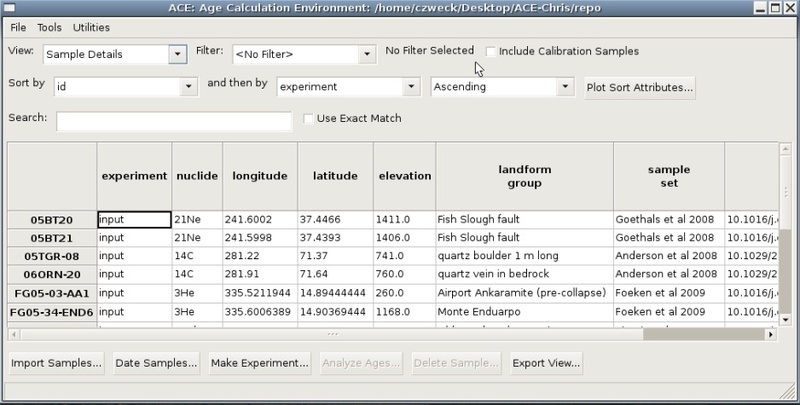 Note that ages shown in this example are set to ‘None’, as these samples have not yet been dated. 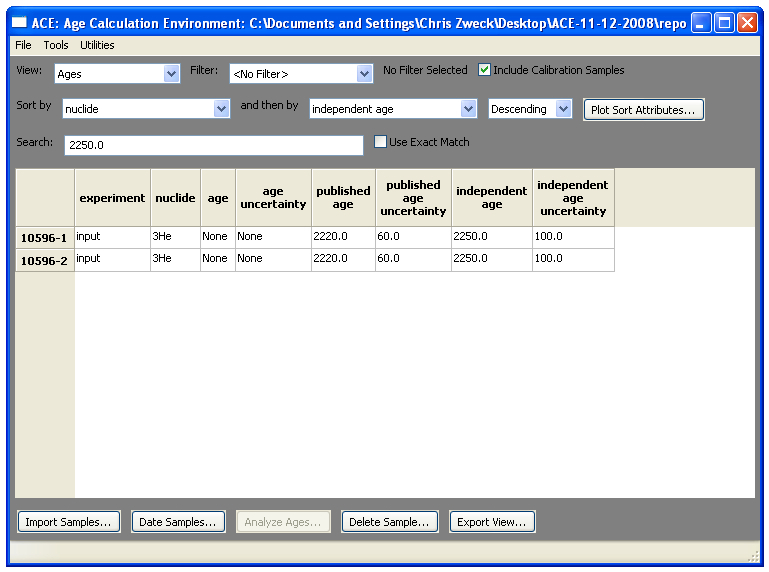 To calculate an age for a sample we need to Date Samples, which is performed by clicking on the button on the lower panel. When this filter is selected, only the 10Be and 26Al samples are shown. As with the View Editor, new filters can be tailor made using the Filter Editor. 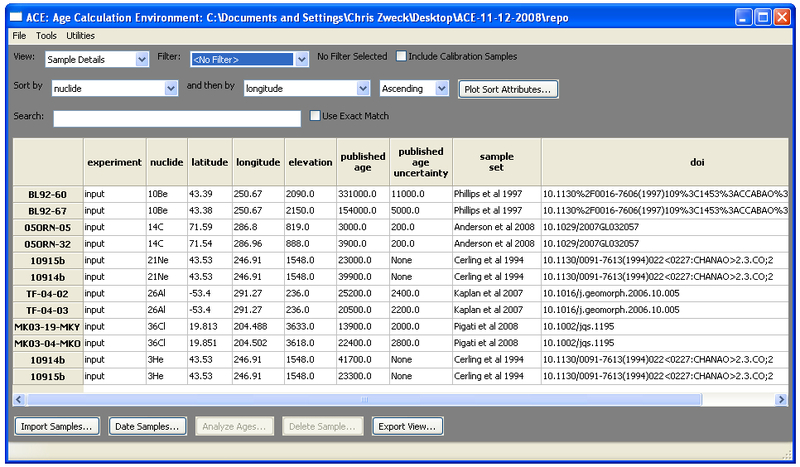 For initial use we include only a handful of samples with ACE, and additional data can be imported using the Import Samples button at the bottom of the screen. We describe this process in the next section. All of the calibration samples are now shown alongside the original samples. The youngest sample is now listed first, followed by the second youngest, etc. To see the oldest sample change the Ascending sort type to Descending. 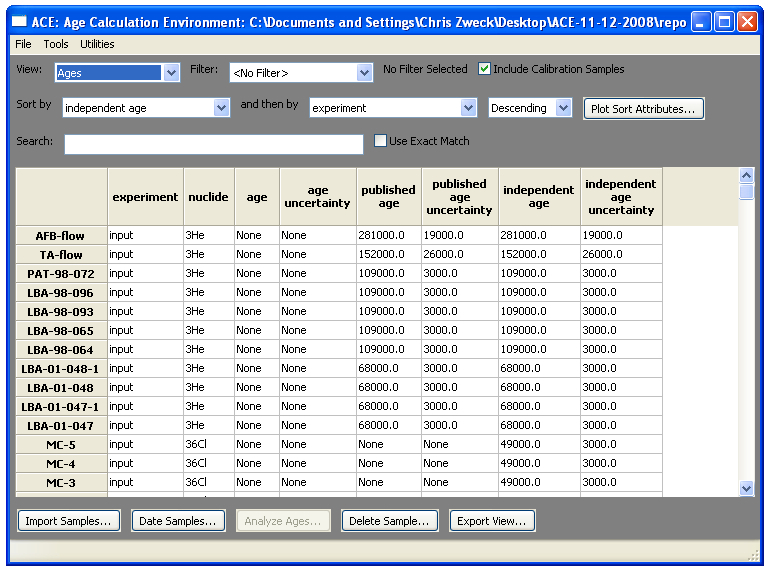 The plot function allows you to become familiar with the data you are working with. 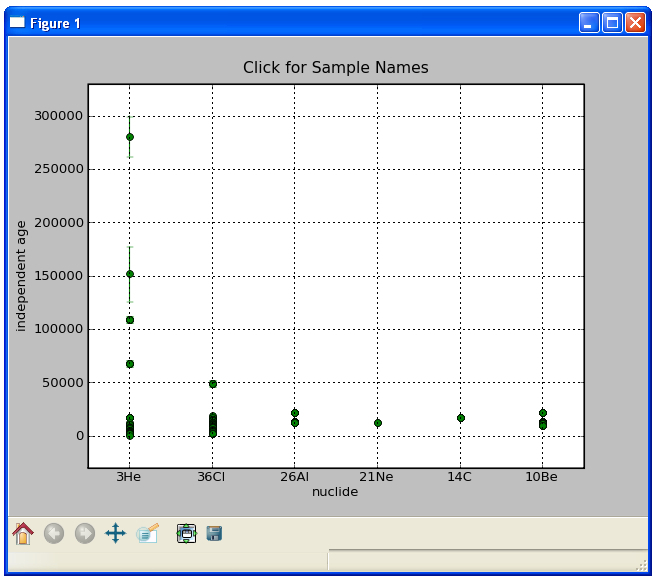 If you find outliers or interesting points you can retrieve the name of the sample by clicking on the data point in the graph. The figure also contains tools which allow for panning, zooming and saving. Details are given here. 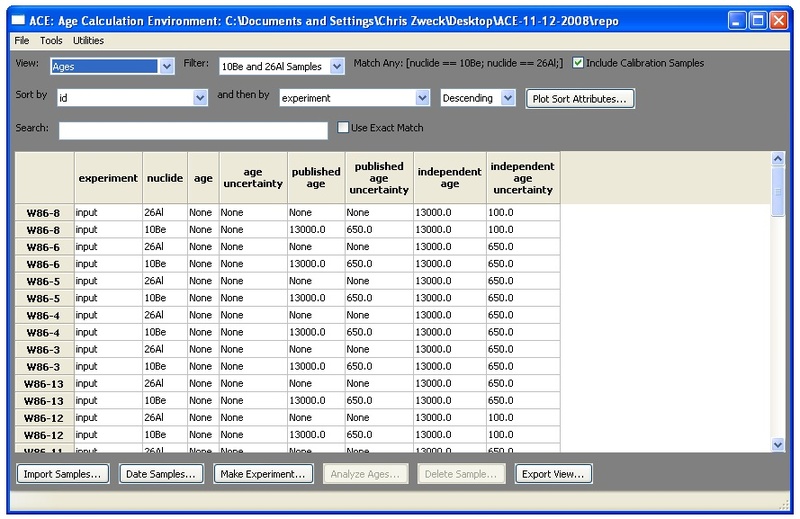 The sample browser returns two samples. The Use Exact Match checkbox is for when you want to return exactly what you typed in, and not show results which contain what you typed in. It is useful for strings like sample names, landform types, etc. The panels at the top of ACE help with viewing data, but the real action occurs at the bottom of the sample browser. 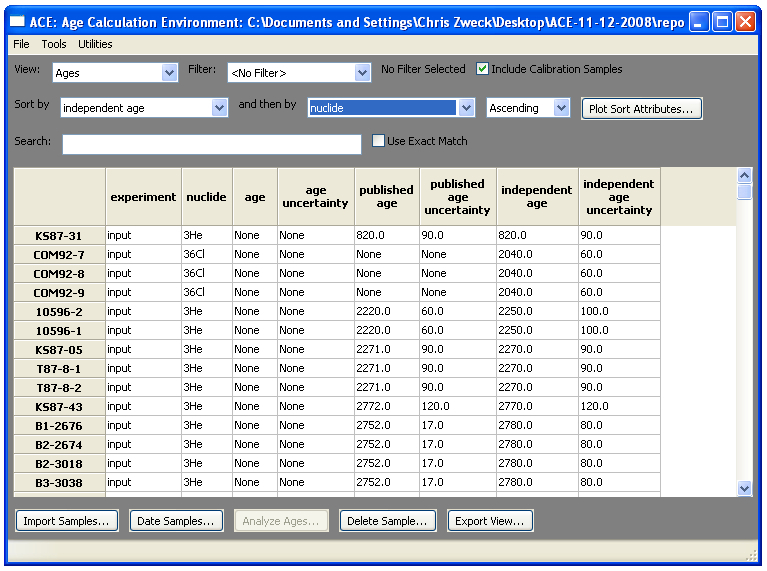 Using these buttons you can import samples, determine sample ages, analyze the age distributions of landform groups, delete unwanted samples, and output your results to a csv file for further analysis and display. To explain how these processes work in ACE, we suggest you follow on with the quick-start guide. 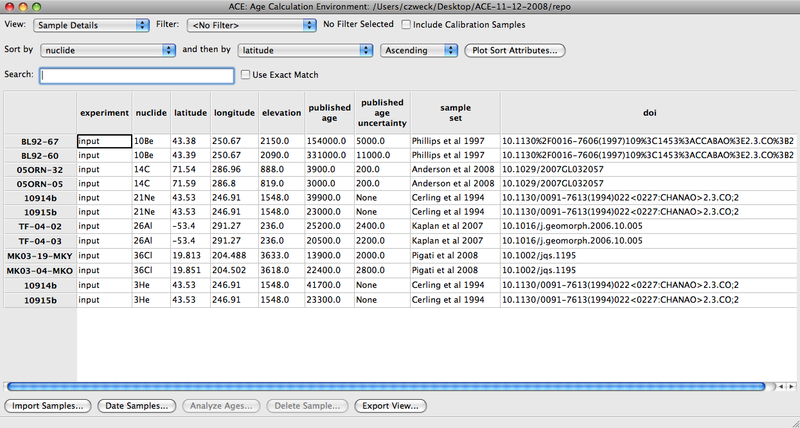 The next section regards importing new data into ACE and can be found here.